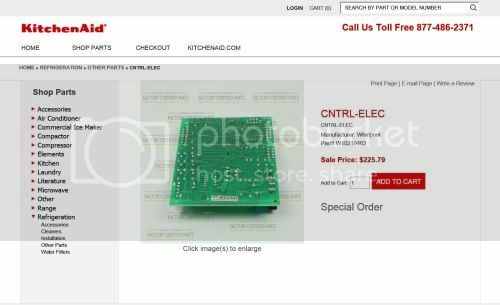 Alert - Failing KitchenAid Refrigerator Control Boards, part numbers 2307028 and the replacement W10219463, are no longer available, and apparently have had a fairly high failure rate. For the good news, I may be able to provide you with a possible simple repair as you read on. These refrigerators are made by Whirlpool, which has a number of other brands and models affected, as shown here. They can include freestanding, or as in my own case, the much more expensive built-ins where you would really expect higher quality and some product longevity. After all, whether remodeling a kitchen with matching appliances or purchasing a custom home with this manufacturer's so-called 'premium' appliances, you surely wouldn't expect them to become basically obsolete in just a few years. Geez, I have a realtively inexpensive 10+ year old Danby mini-fridge from our grill island. It has sat outside in the Las Vegas desert heat, our occasional rain, cold, and even a once in 30 year snow and it never skipped a beat. That also included moving it from our former home. It survived all that abuse while an expensive 6 year old indoor built-in fridge was dying a slow death and a needed repair part that is no longer available. What's wrong with that picture? Oddly enough, a new part replacement part for 2307028, the W10219463, was still listed on the KitchenAid website for $225.79 as a 'special order'. Some other appliance parts sites have these boards listed as either no longer available from the manufacturer, a very few as 'remanufactured' or repaired or sent out to be, or still being manufactured but being released very slowly with a 4 - 6 week lead time. Which is it? I decided to call KitchenAid directly to make sure the boards where actually available and have my order expedited a tad bit less than waiting 4-6 weeks. After giving model, serial, and even part number, I received the reply of a quoted price for the board. Great! They do have them! Oh wait, no they don't. Just after going through all that was when I was told the part was no longer being manufactured and is unavailable. The 'I'm sorry for the inconvenience, but I can help you' that followed just added insult to injury. As I later discovered, this must be the standard scripted line repeated to everyone calling about these boards. In disbelief I called a second time, spoke to a different representative and was told the same thing. Now I'm not knocking the phone staff. They are stuck in the middle, taking the brunt of their upper management's absurd decision. 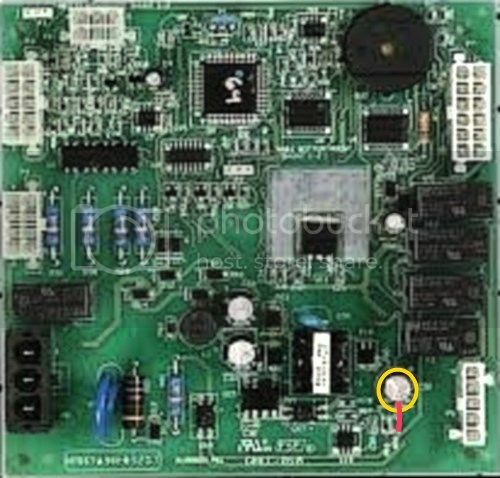 So yes, according to Whirlpool / KitchenAid, and their 'Customer Service' which is apparently an executive oxymoron, they have chosen to no longer make these control boards. The story given to some posting on the Internet is that the plant that manufactured these boards was destroyed in the Japan tsunami of 2011. Amazingly, such a large international company as Whirlpool couldn't find another source from anywhere around the globe. While a shortage or delays could be understandable from such a terrible disaster, to not offer ANY replacement is beyond rediculous. So what was their offer of help? I could call yet another company that would repair my control board. All I would have to do is have it removed, package and ship it to them, and 'probably' it could be repaired in about 10 days, then I could have it reinstalled after it shipped back. Of course my refrigerator would now be totally inoperable during this time. Hey, there's nothing better to get you into the holiday spirit than to have guests over, while you're working out of ice chests, right??? Maybe we could decorate by buying red & green coolers! I think the milk is green # 3! Ahh, the joyous look of surprise and wonder when they open and find it! Now for another Oops. My online research seems to suggest that repair turn-around would be more in the vicinity of 2 1/2 weeks...or more. This is now a truly pleasant experience in the middle of the holiday season between Thanksgiving and Christmas. Especially with all those holiday packages clogging deliveries, or possibly getting lost this time of year. I was even more ecstatic when I made the call to KitchenAid's recommended repair center, Core Centric Solutions. After waiting on hold for quite some time, my call was finally was rerouted...no, not to a someone who could help me...to a voicemail....that was FULL! OK, so now I really want to scream. After regaining my composure, I reviewed my options. I could replace a 6 year old 48" KitchenAid Architect Series refrigerator for about $9,000 + tax, which I'd bet would be a just dandy idea in the eyes of Whirlpool. Well, and that's if anyone has one in stock., it may have to be ordered. 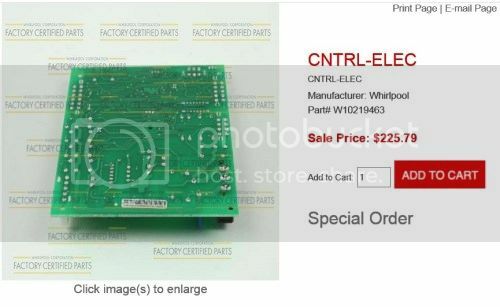 Or I could purchase one of the hoarded few rebuilt boards remaining and in stock at very limited parts suppliers, for as much as the bargain 'Internet Sale Price' of $899 + $100 core charge, plus shipping costs, of course. Or roll the dice with one of the few other board repair companies. With any of those repair options I assume I could step back to the early 1900's and use my now state of the art 'premium appliance' as a giant ice chest. I suppose while even being in the season, repeatedly pressing the 'Holiday Mode' button at this point won't help a whole lot, although it might help pass the time while waiting. This while hoping my board wasn't 'beyond repair', which leaves me wondering if anyone is told their board is irreparable, just so the company could keep and repair it, to sell at a ridiculous profit like those I just mentioned. I mean really, why would anyone want to now pay additional return shipping for a board that supposedly can't be repaired? Fortunately for me, among many other areas he has consulted in, my better half has been involved a variety of electronic applications much more complex than a refrigerator control. Although he now admits he was a slacker (after I vented my 'simple part order' frustration at him) when he diagnosed the refrigerator on a Sunday and suggesting my ordering of a new board the next day. When he found out what I had gone through, he was livid that a company would do this to their customers. While he remains calm in a crisis, you can just tell when he's on the verge, even the dog keeps her distance. So let me back up and explain the symptoms that led to his original conclusion of this control board's power supply failing. The refrigerator was still 'working', sort of, but there was an intermittent clicking noise and a chirp. This could be seconds to minutes apart. What he explained to me was that the click was the relay for the evaporator fan motor which was turning on and off, and the chirp from an alarm on the board when this was happening. Not a good situation as this fan is what distributes the cold air throughout the refrigerator. Might even explain the recent mystery of a some items going bad a bit sooner than I expected. There was no 'call service' light, and the on board diagnostics did nothing more than indicate that indeed the fan was stopping, something he already knew. I'd add here that my later research indicated that this power supply failure can also cause other symptoms, as well. Normally, with so many tiny components now used on a circuit board, and without any board schematics or component diagrams, the simple and most cost effective fix in our throw-away society is to just replace the board. Now faced with this situation of no reasonably priced immediate replacement, and before deciding on the less than wonderful option offered by Whirlpool, my tech guy examined the board for any visual clues. That's when he discovered a rather simple fix. It seems he was not alone in his discovery, as later I found a poster named Phil had made the same and shared it in the comments on this My3Cents Forum of complaints about this problem. Others on that thread also used this repair and it had worked for them. Hopefully it will for any other victims of this situation who are reading this post. This forum is just one of many to be found with complaints about this same board issue. If your board looks like the 2307028 board pictured above, this may be of help to you. As you can see marked in yellow in the picture of the board, there is a small circular device called a capacitor. The top of the aluminum 'can' is made with indentations designed to split to relieve pressure in the event of a failure, so the capacitor doesn't explode. While ours hadn't separated, it was ever so slightly bulged, indicating that it was indeed beginning to fail. As you can see from the image of failed capacitors below, ours was similar to the one in the center, not perfectly flat on top. Of course they can also push out the plug at the other end or completely split at the top. I honestly admit that at the time I was skeptical that this seemingly minor bulge could be a failing part causing such a problem, but he insisted this was common in electronics. 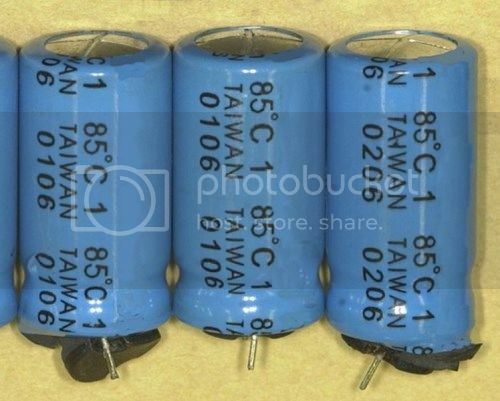 In particular for capacitors manufactured in Taiwan between 1999 and 2007, and our capacitor just happened to be from a Taiwanese manufacturer. The Capacitor Plague, as it was called, was due to the use of a poorly formulated electrolyte, reportedly stolen, even multiple times, in a strange case of industrial espionage. It was known to him, and should obviously be known to a major manufacturer like Whirlpool. After all, many manufacturers suffered failures of so many electronic devices from this period. Dell alone had a $300 million loss because of it, and brands from Apple to HP and everything in between became victims. Whether caused by this plague or not, it seems that many more of these capacitors had failed, and still no excuse for not having ANY replacement boards. So here was his fix, a $1.49 Radio Shack 220uf 35 volt electrolytic capacitor, part number 272-1029. Of course I'm thinking he's out of his mind (Which I do a lot, and dangit, it kills me, but he's almost always right.). How could it be so simple, and so inexpensive, after seeing board repair expenses in the $225 - $900 range? Hey, but what the heck, if this quick fix doesn't work it's no big loss of time or money, especially compared to those alternatives. Needless to say you could purchase some other brand, but this was his most convenient option as unfortunately he didn't have any parts with the same values in his home electronic parts stash. Now while he's a bit more experienced in electronics than most, he said this isn't rocket science. If you have soldering skills he feels it's not that difficult at all, as this part is pretty easy to get to and replace for even someone who hasn't worked on, say, the Starship Enterprise, or that complex stuff that he's worked on. Still, this is up to you to decide what fits your own abilities. For the technically challenged like myself, I would have to seek some outside help, and you may, as well. Still, it seems a bit better than the 'help' option offered by Whirlpool, even if you have to pay someone qualified to examine and do this for you. With the power disconnected by either unplugging or turning off the refrigerator's circuit breaker, locate and remove the board. In the case of our built-in it was on top in a metal housing above the condenser coils. (BTW, great location for electonics, above a heat source.) I've come to understand that in a freestanding model it in may be located in the bottom rear. After removing the two screws and sliding out the metal housing, turn over to unplug the wire connectors from the board. Those have locking clips so you'll either need to gently squeeze or pry those locks up to remove those connectors. After that, gently squeeze the circuit board mounting clips protruding from the metal housing, and remove the board. Now examine the board itself. My techie says that if the board or any of it's other parts look distorted and burnt, like some of the meals he's been served, (OK, so cut me a break, who hasn't accidently used the extra-krispy cooking method) then going any further probably won't help. Should everything else appear alright then locate and examine that capacitor for any slight bulging, splits or leakage. Note the direction of the stripe on the side of the capacitor, which was marked in my board photo as a red line. This is the side of the lead that MUST be installed in the same position. He said that you then carefully desolder the 2 leads and remove the capacitor from the board, as not to pull the etched metal from it, and making sure the mounting holes are open. Trim the leads on the new part, insert it into the board again noting that polarity stripe position, and solder into place. Next replace the board clips back into the metal housing, and plug in all the connectors. Put the housing back into position and replace the mounting screws, and then turn on the power. If the this repair has worked for you the clicking and chirps will be gone. After the programmed delay of about 7 minutes the compressor and condenser fan will come back on if your temperature settings are calling for more cooling. Hopefully that worked for you and relieved some of your frustration and possible hair loss, and trust me here, we feel your pain more than you might imagine. Even before relocating to Las Vegas, both of us have owned, built, and grew successful customer service oriented businesses. I guess that's why we especially consider it absolutely unbelievable that a massive corporation lacks the very basics of customer service in this control board issue. We value our reputations, and apparently in this case Whirlpool does not. After all, we're not talking bargain basement or antique products here. Still, it makes me assume that since they've gobbled up or are the maker of so many different labeled brands, they feel they can get away with it. What else will you buy? Oh, they own that, too? To us, and I'm sure to anyone affected by this situation, the company's lack of a replacement part, even their own stock of reasonably priced remanufactured or a modified replacement board, is totally inexcusable. This is the reason I wanted to offer this possible solution to others. It's something that the company itself should, at the very least, offer as help. It just appears so many these days are in a hurry to grab your money, but any follow through or service after the sale, well that is becoming rare commodity. It's actually becoming precious when you find any who really care. Now that I've been working in Las Vegas real estate, if I treated my clients with such disregard I'd have been out of business in no time. 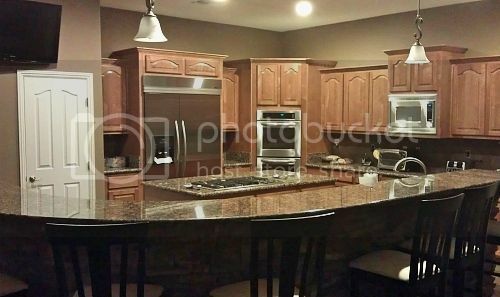 I can't imagine having someone signing for a home listing and then telling them to seek someone else for their home photos, or at best I'm just taking some crappy cell phone pictures to market their home. I surely wouldn't sit back and do nothing more than just add their listing to the MLS and be unreachable. Nor could I imagine telling a home buyer to do their own home search, and while they're at it, figure out all the proper paperwork, procedures, information and guidance that would protect their interests. Heck, this is only what is likely to be one of, if not the largest, financial transactions of their life. 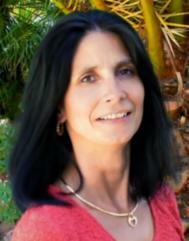 Yet you still see it happening today with so many online sites often labeled as leading sources for real estate. What, as a do it yourself? Trust me, it can, and does, often become pretty complicated. These sites' 'recommended agents' aren't vetted for their ability, they only takes the money from anyone who is willing to pay their price. They don't care if the consumer gets good information and service, or not. They've already made their cash by selling a place for a face, or your contact info as a 'lead'. Anyway, it seems that more and more in any business out there, all they want to focus on is taking money from you, but while not offering much in the way of true customer service in return. I hope this post may be able to help anyone else who has had the misfortune of experiencing this situation of this same model of failed Whirlpool / KitchenAid control board. 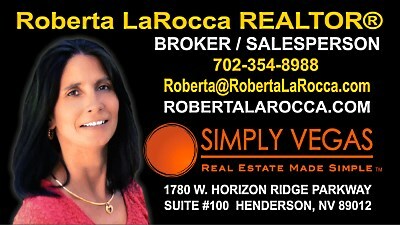 For anyone reading this that also happens to be interested in listing or buying a home in the Las Vegas area, I also hope that you allow me the opportunity to help you with that. 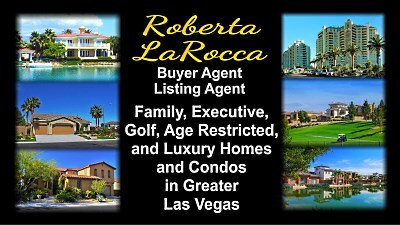 If you should need my services, please don't hesitate to get in touch, either by email at Roberta@RobertaLaRocca.com or give me a call at 702-354-8988. I look forward to hear from you!